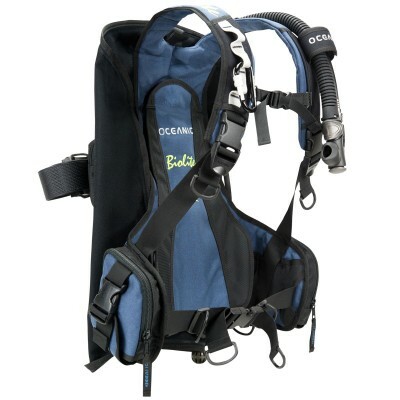 Oceanic has launched a multi purpose ultra light BCD that doesn't greedily gobble up divers luggage allowance. Weighting in at a meagre 5.5lbs (size Large) the Oceanic BioLite benefits from a clean straightforward design that focuses on providing the diver with comfort and convenience. Whilst the BioLite is one of the lightest BC's in the world, it certainly is no 'light-weight'. Today's modern diver demands high-quality durable materials, and Oceanic's patented low profile Bioflex bladder and Cordura construction delivers that. Weight integrations and trimming has also been considered with the streamlined 'Quick Drop' Weight System accommodating up to 14lbs, whilst dual 5 lb trim weights can be added to the tank band.